Following on from a series of limited edition 7″ singles and the compilation album The Strange Little Lines That Humans Draw In The Dust, Girl One And The Grease Guns return with what looks like their final outing. Night Of The Living Electrical Appliances is a 12 track album conceived in the Guns’ own studio The Glass Factory, drawing influence from the likes of Cabaret Voltaire, Silicon Teens and Crash Course In Science, as well as early Depeche Mode and The Human League. The enigmatic outfit, which consists of Sissy Space Echo, Warren Betamax, Charles Bronson Burner and Bruce LeeFax, started out with a manifesto of “causing confusion with a mixture of pure synth pop and more experimental electronic sounds”, of which the new album serves up in style. The new album continues Girl One And The Grease Guns decidedly eclectic approach to writing and recording. Stating that the new material mixes “pure electro-pop with more experimental, darker sounding tracks”, the outfit have delivered an album that boasts pop elements on tracks such as ‘He’s A Replicant’, ‘She’s A Calculator’ and ‘Emergency (Dial 999)’. But their more experimental side is evident on the likes of ‘Telegraph Street’, ‘Mute Your Gums’ and the eerie album closer ‘(She Sits) In The Freezer’. As with previous releases, there’s a love for ’60s girl groups, combined with a ‘garage punk’ aesthetic which at times sounds like something Joe Meek would have dreamt up. There’s certainly a raw energy to the tracks on Night Of The Living Electrical Appliances that work their magic on the ears. Songs such as ‘The Voices In The Walls’ weaves in a New Order-esque bass with a motorik beat, over which a breezy melody and vocal float. Stepping into more experimental territory, ‘Telegraph Street’ delivers a harsh, fractured collage of sound which appears to be treading similar ground to their earlier song ‘(Here Come) The Catastrophe Machines’ with layers of distorted electronics. Elsewhere, there’s synthpop goodness on tracks such as ‘Deaden The Glare’ and ‘Emergency (Dial 999)’. The energetic ‘Some Of It Is Blurred’ is like a contemporary take on Neu! and there’s also a similar German school feel to the melodic charm of ‘Turn It Around Again’ (particularly in the Mellotron-esque chords that wouldn’t be out of place on early OMD). Closing the album, ‘(She Sits) In The Freezer’ is all brooding tones and reversed melodies, a fitting downbeat end to proceedings. 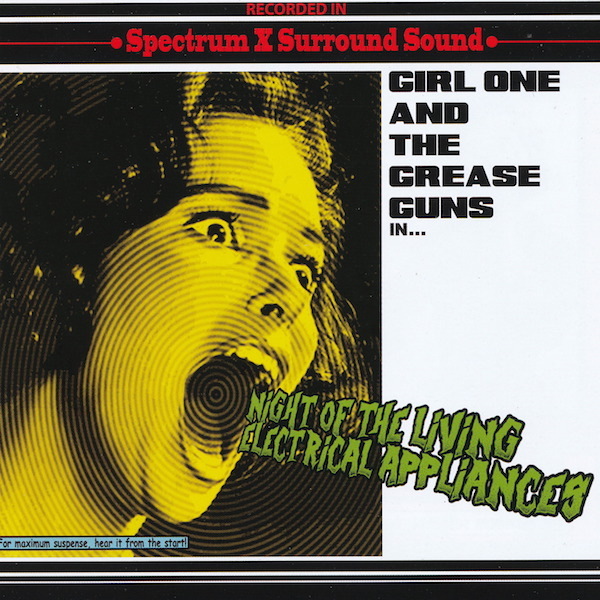 Night Of The Living Electrical Appliances marks the end of the Girl One And The Grease Guns story as they’ve stated that this will be their one and only album release. Cryptically, they mention on the sleeve notes: “We do not know what we’re going to do next. We haven’t planned that far ahead. We like it that way”. It’s a closing statement that suggests perhaps the door isn’t quite closed forever. Night Of The Living Electrical Appliances is out on Next Phase: Normal Records and is available via Squirrel Records.